It may seem somewhat strange to be talking about flooded roads in a state that has faced years of serious drought conditions. Still, Mother Nature always seems to have a few tricks up her sleeve and our region saw some soaking rains in September. Our Northern California injury attorney believes it is always important for drivers to remember the basics of flood safety. Late last week, wet weather made a guest appearance in Northern California. On Thursday, downpours caused major crashes on at least three major highways according to The Oakland Tribune. Wet weather made headlines again on Friday with KCRA News 3 reporting that the National Weather Service issued a flash-flood warning for Solano County that lasted nearly three hours. Radar revealed a 2 to 3 inch rainfall in about three hours, sparking flash flooding that impacted local waterways and flooded at least one roadway. As the name suggests, flash floods strike fast and without warning. Awareness and preparation are key. The best way to drive in severe weather is not at all. Unless travelling is essential, stay put in severe weather. Never drive through a flooded area. Turn around and look for an alternate route, even if the water appears shallow. Dips in the road are just one of the reasons water may be deeper than it appears. Floodwaters can scour away the road surface and even some of the ground below, meaning there may not be solid road underneath the water. If there is no alternative route available, move to higher ground and wait for flooding to subside or for help from road crews. If your vehicle stalls, the best choice may be to abandon it and get yourself and your passengers to higher ground. You are more important than the nicest car. A few facts on water depth – Six inches of water is enough to reach the bottom of most cars, creating the danger of stalling and/or loss of control. One foot of water is enough to float most vehicles. Two feet of moving water will sweep away most vehicles, even an SUV or pickup truck. While rains moved out of our region as quickly as they came, it is still important to be ready when heavy rains strike. We hope all of our clients and other readers use caution and remain prepared for a range of road conditions. Remember: Getting there late is better than not getting there at all. 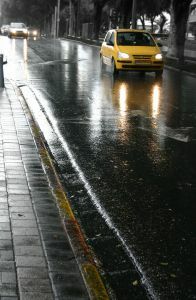 Even if you are ready for wet weather, other drivers may not be. If an ill-prepared driver causes an accident that harms you or your loved one, you may be entitled to compensation. Flooding and other adverse weather conditions may be a factor in a crash, but it is not an excuse for careless driving and failing to be prepared for and respond appropriately to changing conditions can amount to negligence. Call our Northern California car accident injury attorney to discuss your rights if you are paying the price for someone else’s disregard for safety.